Welcome to Schumacher Auto Group. We’re a family of auto dealerships located in North Palm Beach, West Palm Beach, and Delray Beach, Florida. We combine dedicated and customer-centered service with a wide selection of cars for sale from top brands like Dodge, Chrysler, INFINITI, Buick, GMC, Volvo, Chevrolet, Subaru, Mitsubishi, Lincoln, Jeep, Volkswagen, and RAM to create a better way to buy cars. We’re also your local source for high-quality used cars. We work to make every aspect of your car-buying experience easier, including quick and simple auto financing. Our relationship with you doesn’t end when you leave our lot. Each of our campuses has a fully-equipped service center staffed by experienced and certified auto care professionals. Learn more about why you should join the Schumacher Family. If you have any questions, feel free to reach out to us at (561) 935-4690. That is the mission of the Schumacher Family of Dealerships. It is the driving force behind the hard work and sincere commitment on the part of our team to provide you with the best automobile shopping experience possible. Value and quality in the products you choose is just the beginning. Service and commitment are long-lasting. For over 40 years Schumacher has been an organization that people know to be of the highest integrity, providing you world class products and a sincere focus on your ongoing satisfaction. Our customers and employees are our greatest asset and we respect and value their contributions. I invite you to join the Family of Satisfied Schumacher Customers. Richard Schumacher opened the first Schumacher dealership, Schumacher Buick of West Palm Beach, on Okeechobee Boulevard in 1971. With a strong commitment to the community and dedication to creating the best experience for local customers, it quickly became Florida’s top Buick dealership. Richard’s son, Chuck Schumacher, would eventually take over operations of Schumacher Buick in West Palm Beach, helping it grow to the number one Buick dealership in the nation. Chuck then turned his focus to growing the Schumacher brand and bringing the same commitment to excellence to new regions. In 1997 he opened the first North Palm Beach location, offering Mitsubishi, Volkswagen, GMC, and Buick vehicles. Most recently, Schumacher has opened a campus of dealerships in Delray Beach. Schumacher currently employs over 900 employees across our different dealerships. We’ve also begun a partnership with the Palm Beach International Speedway. Through this growth, we’ve never lost track of what made us successful for over 45 years: A strong focus on putting our customers and community first in everything we do. 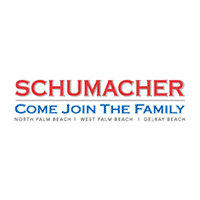 The Schumacher Auto Group is proud to call the Palm Beach and Delray Beach communities home. We know we wouldn’t be where we are today without your help, which is why we work to give back to the local community whenever possible.